fferent types of mesh defects are classified according to the upstream application that produced the mesh, whereas mesh quality requirements are grouped by representative sets of downstream applications where the mesh is to be used. The numerous mesh repair methods that have been proposed during the last two decades are analyzed and classified in terms of their capabilities, properties, and guarantees. 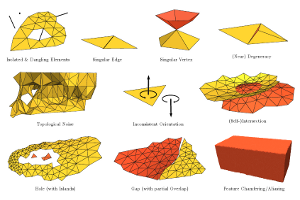 Based on these classifications, guidelines can be derived to support the identification of repairing algorithms best-suited to bridge the compatibility gap between the quality provided by the upstream process and the quality required by the downstream applications in a given geometry processing scenario.